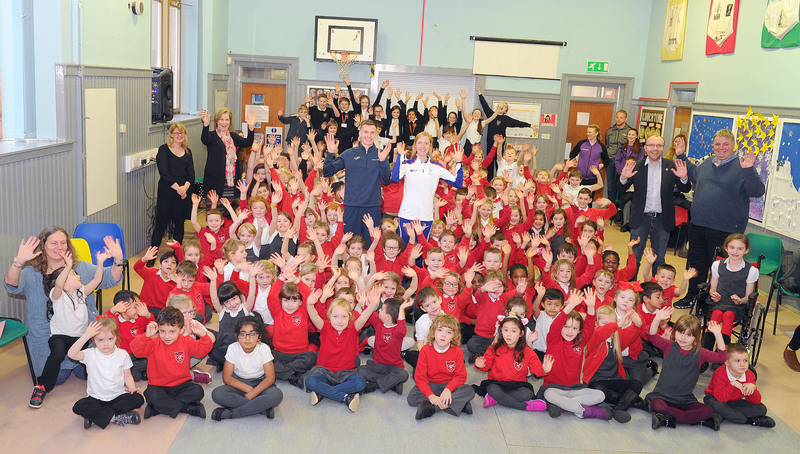 Children at two local primary schools were inspired to get active today when they were visited by two running stars who will compete in this weekend’s Simplyhealth Stirling Great XCountry. Adam Craig (Scotland) and Charlotte Arter (Wales) will represent GB and Northern Ireland in the prestigious international event which will be staged in Stirling for the first time on Saturday (Jan 12). First, the elite athletes stopped off at Gargunnock PS, with pupils quizzing the pair on a wide range of subjects, including how they prepared for races and what inspired them to get into the sport. It was a two-way conversation as Adam and Charlotte asked the children about the ways they enjoyed being active and chatted to the school’s Sport Stars group and cross country running club. The runners then made the short journey to Allan’s PS, where they were greeted enthusiastically by the children with an upbeat musical welcome. After telling the pupils about their journey into the sport, the duo took part in a lively Q&A session. Among the topics covered by the children were running and nutritional advice, Adam and Charlotte’s motivation to continue in athletics and the people who inspired them growing up. And many hands were raised when pupils were asked if they would be attending Saturday’s sporting spectacular in Stirling, which will be screened live to a UK and global audience on BBC One. Along with the elite race, Stirling will also host the inaugural Simplyhealth Great Stirling Castle Run – part of the city’s bid to break down the barriers to healthy and active living on a world-class day of athletics. The sold-out mass participation event will see 1,600 runners take on an exciting multi-terrain course past some of Stirling’s most iconic landmarks. Stirling Council, working with the Great Run Company and Active Stirling, has also ensured there will also be an opportunity for families and young people to get involved in the action, holding a mini-version of the cross country race in the event village. Adam, who is the 2018 Great Scottish Run 10K winner, will participate in the Stewart Cup International Relay (2.35pm), while Charlotte will hope to come out on top in the Women’s Senior Race (1.23pm). Pictured are pupils and staff at Allan's Primary School, elite athletes, Adam Craig and Charlotte Arter; Councillors (from left) Maureen Bennison, Susan McGill, Danny Gibson and Chris Kane; and staff from Active Stirling. Note: The International Cross Country Championships will further develop the partnerships between organisers Great Run, Stirling Council, EventScotland, Sportscotland – the national agency for sport – and Scottish Athletics.